Commentary: The Ewok Nho'Apakk was one of many original trilogy characters that went nameless until merchandising dictated one be assigned. This, like Wicket W. Warrick, is inspired by a real-world person. Specifically, a sick kid named Noah who was put in contact with Hasbro and they made this 2-pack to fit his wishes. You've got good taste, kid. The famous, yet anonymous, young boy passed away just a few months ago and little is known about him beyond his fondness for the films, and we can all agree with him on that. Godspeed, little dude. I like the figure. It's a retool of Graak, given a new head and a new spear with three awesome spikes. Some of the weapons look pretty good, but this one looks like it could do some serious damage. Because of the flexible body types, Hasbro can get a lot of mileage out of these bodies, and continues to do so with a myriad of multipacks. They took their sweet time ramping up Ewok production, but pretty much every one we get now is excellent... except for Kaink. Kaink could be better. The fur color and paint make it look like a totally different mold, proving that repaints, when done correctly, are awesome. Not only do several Ewoks share this body, more are coming. The figure's head reminds me a lot of a famous collector who shall remain nameless because I'm a nice guy, and the hood is nicely wrinkled with some nice ornamentation. As Ewok accessories go the staff is probably my favorite, or perhaps #2 to Wicket's green cartoon hood from 2010. At the right price, I'd buy pretty much any Ewok. At the wrong price... well, keep reading. Collector's Notes: Did I mention I like Ewoks? Well, I do. eBay says loose samples of Nho'apakk with Paploo now go for a surprisingly high $25-$35 while carded samples could go from between $20 and $50. 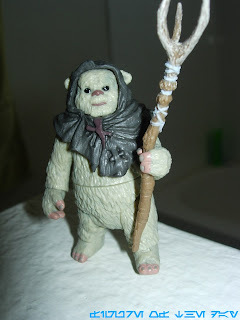 I would like to say "it's not worth the money" but that's a baldfaced lie-- I like the design and chasing down new Ewoks have been a constant for me since I was a kid. (And overpaying for them has been, at times, an unfortunate tradition.) This set did ship in a couple of revisions, so its higher price speaks well of fan interest in Ewoks. This is notable because while Ewok was always a four-letter word, the little furballs were not exactly welcome to most collectors until juxtaposing them with Gungans rendered them tolerable to the cranky older collector masses who weren't six when Ewoks aired on Saturday morning television.